Hope everyone had a nice holiday weekend! Easter was a fun and food filled celebration, as usual. Waaaay too much, again, as usual. Which is why I opted for a lighter pasta dish. And it was a big hit. I made this 2 days in advance which was perfect as far as prepping for the holiday meal. It’s always helpful when you can get things done in advance. But, I was all ready to go when I realized I had no walnuts! But pignoli nuts were a great substitute. Like I said, everyone loved this! I tripled there recipe so there was plenty leftover…into the freezer it went for another time. Make this soon! Preheat the oven to 350 degrees. Spread pignoli nuts on a baking sheet and toast for 8 minutes, until fragrant and lightly brown. Let cool. In a large pot of boiling salted water, cook the broccoli rabe until tender, about 3 minutes. Drain and let cool under cold water. Squeeze out excess water and coarsely chop the broccoli rabe. In a large pot of boiling salted water, cook pasta until al dente. Drain, reserving 3/4 cup of the pasta cooking water. Add pasta to the pesto sauce, then stir in the reserved cooking water and toss until pasta is well coated. 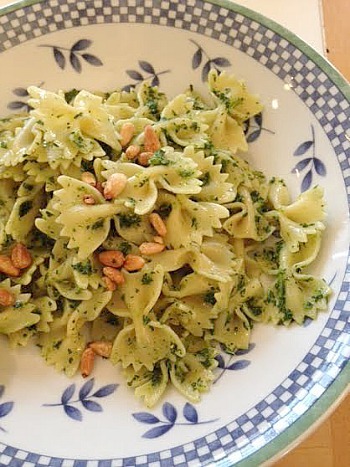 Sprinkle with the reserved pignoli nuts and serve with more pecorino, if desired. This entry was posted in broccoli rabe, cheese, freezer friendly, Italian, main dishes, make ahead, pasta, pesto, pignoli. Bookmark the permalink.